Interactive map shows average response times for all fire rescue stations in Palm Beach County. 13 new firefighter positions were approved by the Palm Beach County Commission Monday. 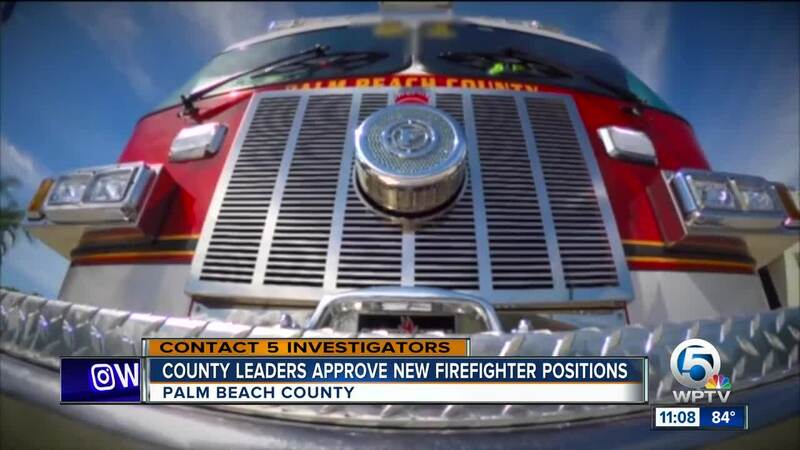 UPDATE: The Palm Beach County Commission approved 13 new firefighter positions Monday. Fire Rescue Chief Michael Mackey told Contact 5 he hopes to add 6 new firefighters to Station 22 within the next 4 months. County leaders hope the additional staff will cut down response times. Commissioner Melissa McKinley said it's a good first step. "I think when you start seeing the city of Westlake expand and other potential growth communities out in the Acreage, we’re going to need more fire stations and definitely more personnel," said Commissioner Melissa McKinley. Fire Rescue Chief Michael Mackey could not say enough good things about the county's decision Monday. “We talked about it before, it’s the roads, it’s the area that they’re in, they have long response times and we’re very happy about it (the new positions). Excited," said Cheif Mackey. Commissioner McKinley says she would love to add more staff to every station in the Acreage down the line. The county hopes to break ground on a new building for Station 22 in November. 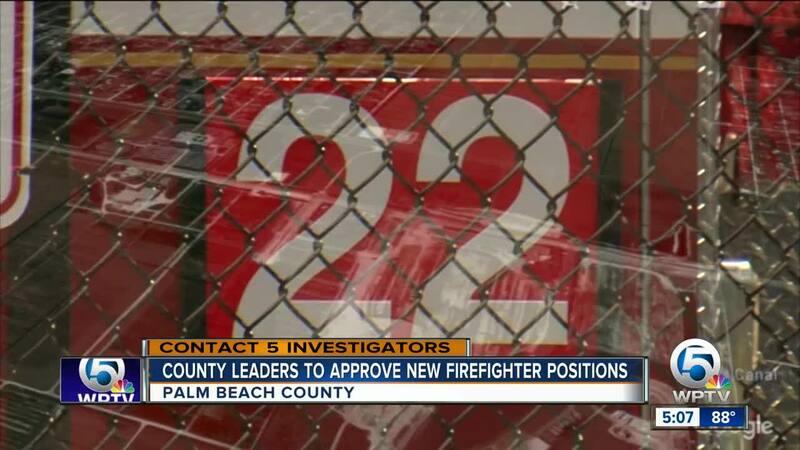 UPDATE: The Palm Beach County Commission is set to approve 13 new firefighter positions Monday. Fire rescue says 6 of those firefighters will be going to Station 22 in the Acreage area. 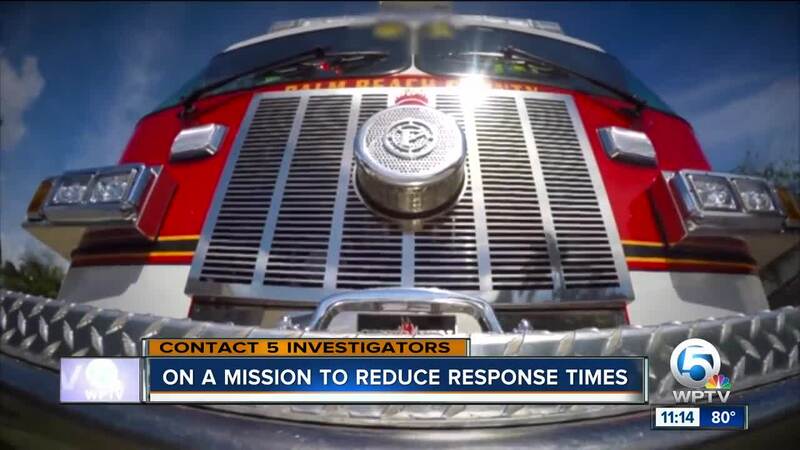 A recent Contact 5 investigation showed that station 22's average response time is 10 minutes, higher than many other stations in the county. Contact 5 took two years of response times and found 42% of their calls took more than 10 minutes. Contact 5 learned there are only 3 firefighters on shift at one time, and one firefighter told the county serious calls have had to be dropped because of the lack of staffing. 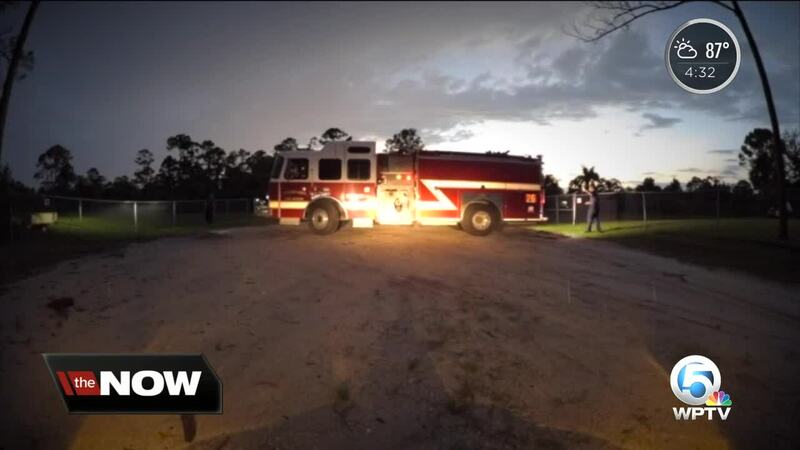 An Acreage woman wants more Fire Rescue resources for the Western parts of Palm Beach County, to improve response times in a fast-growing area known for its sizable lots and rural feel. Palm Beach County Fire Rescue's top chief explains the challenges his agency encounters, and the county mayor explains why she argues for extra dollars in the budget. Contact 5 Investigators analyzed a quarter million Fire Rescue response times. This interactive graphic lets you explore response times for all county fire stations. “I’ve never heard such a huge boom in all the years I’ve been here." It was January 12, 2017. Avocado and Key Lime Boulevards steps away from Michelle Damone's house. "The van was on its side. I have a young father who is passing away in front of me, with a vehicle that landed on his head, and I have a young lady who’s not breathing, who’s in my arms and hands," says Damone. She says she spent more than 10 minutes on the phone with 911. "And the fire rescue vehicles had not arrived, when I hung up the phone." In her opinion, "That response time was too long. We deserve the most accurate response time that we can get practically and logically in this community." This experience has inspired her to push for more resources out West. "Because I’ve served out here as an elected official in the past, I’ve had fire rescue and other people who serve in this area come to me, say that we do not have enough fire rescue personnel, or we don’t have enough vehicles to respond," said Damone who in the past has served four terms on the board of the Indian Trail Improvement District. Station 22 and Station 26 are the two main stations serving the western communities. "We try to send out the closest available unit to any call," says Palm Beach County Fire Rescue Chief Michael Mackey. From 2016 to 2017 the number of calls to both stations increased by double digits, far outpacing the countywide growth of 4.5%. In addition to the increasing call volume, first responders regularly encounter obstacles in an area known for its sizable lots and rural feel. "We have longer response times out there but it really exasperates it when you have poor road conditions," says Chief Mackey. "A lot of those roads are dirt roads and they are not maintained that well," says Mackey. "We also have drainage issues. The roads, the way that the canals are and we don’t have thru streets, that poses a real difficulty for us. There is poor lighting and some places there is no lighting, it’s pitch dark." As the western parts of the county are becoming more populated, demand for services is expected to increase even more. The City of Westlake would bring 4,500 additional homes to that area. "We’re very aware of the growth," says Mackey. Of all fire stations, Station 22 has the highest (slowest) average response time. It also has the highest percentage of responses that took more than 10 minutes. After 14 years Station 22 is still considered a temporary station, housed in a Winn Dixie Plaza. There are only 3 firefighters on shift at one time according to Fire Rescue. A firefighter from 22 wrote to Fire Rescue's Safety Committee in January saying, "In my short time at 22, there have been multiple occasions in which serious calls have dropped while 22 was on a call." When asked if they need more personnel out there, Chief Mackey said they have a staffing committee that works with the union and administration. "We sift through all the data and we look to see where those positions are needed. We want to see about 1,095 calls, which is 3 calls a day. " Many stations had personnel cut years ago during the recession, explains Palm Beach County Mayor Melissa McKinlay, "It all comes down to dollars right now. We’ve started to see the return of the third person on the truck in higher medical call areas," the County mayor said.. Asked if she would call the Acreage underserved, the McKinlay says, "I don’t know that I would call it underserved. I would probably say that it just grew a little bit faster than we had anticipated and we’re playing catch up." "In this year’s budget, we actually have the funding to increase the staff at 22. We made the argument that the severity of the calls were greater than some of the other communities that maybe had a higher call volume and I’ve continued to make that argument," says McKinlay whose district (6) includes the western communities. Contact 5 has learned the proposal to put additional staff at 22, by six firefighters (that's two added firefighters per shift), will go up for final approval at the county's final budget hearing on Monday, Sept. 17. "There’s a reason for everything. My heart still aches for all three of the people in that accident but I’m hoping that if nothing else, it brings more facilities out here, more rescue vehicles, more personnel," says Damone when asked about her fight. In 2016 and 2017 Palm Beach County Fire Rescue responded to nearly 250,000 calls. The average response time for all Palm Beach County Fire Rescue stations fell from 6 minutes and 46 seconds in 2016 to 6 minutes and 21 seconds in 2017, which is under the target of 7 minutes and 30 seconds that Palm Beach County Fire Rescue has set. From 2016 to 2017 the number of calls county wide grew from 122,178 to 127,724. Fire Rescue has around 1,500 employees and its budget for FY 2017 was nearly $280 Million . Palm Beach County Fire Rescue services unincorporated Palm Beach County and 19 municipalities. Michelle Damone sent to County Commissioners ( read the contents of this email here ). This prompted us to look into the response time issue. We requested a database of response times for 2017 and merged this data with a database of response times for 2016. We analyzed the total response times as provided by Fire Rescue, which we understand to be the time difference between when the call is received and when first responders arrive on the scene. The map lets you explore for each of the fire stations the location, number of responses, the average response times as well as the percentage of responses that took more than 10 minutes. This is based on 2016 -2017 response times data. If the graphic does not display correctly click here .